On November 6th, a San Diego Superior Court judge ruled that a Carlsbad woman who was originally ordered to pay her abusive ex-husband’s legal fees will not be required to foot the additional bill of $25,000 in attorneys fees. As part of a divorce settlement, Crystal Harris reportedly agreed to pay $47,000 in legal fees to her former spouse, Shawn. In 2010, a judge ordered Harris to pay an additional $25,000 in attorney’s fees despite that her former husband was charged with sexually abusing her. Shawn Harris was later convicted and is currently serving a prison sentence in connection with the alleged assault. In response to the judge’s order, Harris successfully began working towards changing California law. Beginning in 2013, a California judge may no longer order the victim of spousal abuse to pay his or her abuser following a divorce. Harris stated she hoped the law would protect other victims of spousal abuse. Still, Judge Maureen Hallahan stated ignoring the new law in the Harris case would contravene both public policy and the intent of California legislators. Consequently, Judge Hallahan ruled that Harris would not be required to pay the $25,000 in additional attorney’s fees her former husband sought as a result of the couple’s divorce. As this case demonstrates, the facts in every divorce are unique. Although California law normally seeks to divide both property and debts equally, a number of factors can have a dramatic effect on a divorce settlement. In addition to their assets, a former couple’s debts will normally be distributed in the marriage settlement agreement. In California, any property acquired between the date of the marriage and the date of separation will generally be deemed community property. Still, there are important exceptions such as preexisting support responsibilities and student loans. If you are considering ending your marriage, it is always a good idea to discuss your individual situation with an experienced divorce attorney. A competent family lawyer will explain your rights, help you protect your financial interests, and discuss what to expect throughout the divorce process. 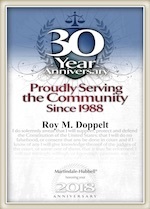 If you would like assistance with divorce or another stressful family law matter, please call Doppelt and Forney, APLC toll-free at (800) ROY IS IT (769-4748) today. Mr. Doppelt is a knowledgeable San Diego divorce lawyer with more than 20 years of experience guiding clients through the frequently contentious California divorce process. Mr. Doppelt is available to help clients with all of their spousal support, divorce, child support, child custody, adoption, paternity, and other family law issues. Doppelt and Forney, APLC represents clients located in San Diego, Linda Vista, Encinitas, Scripps Ranch, and throughout Southern California. To schedule a free confidential consultation with a capable family lawyer, contact Doppelt and Forney, APLC through the law firm’s website.